I was actively participating in the Meet Me on Monday Blog Hop hosted by Java over at Never Growing Old. Sadly she stopped doing it but thankfully I just noticed that another blog has picked it up. While I have missed out on the first couple, I am excited to start up again so here goes for this week. 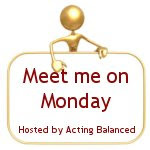 Want to join in on the fun, simply click the button below to head over to Acting Balanced, answer the questions on your blog and link up! 1. What is on your bedside table? 2. Hardback, Paperback or E-Reader? 3. What is your 'go to' drink of choice? 4. How do you like to spend your birthday? Alarm clock, some books (kids and mine), mouth guard (night time teeth grinding) and lots of junk! I prefer paperback but will take hard cover too if that is what the library has! Dinner out with my family and some relaxation time! Lycra tights and lace bottomed t-shirts... like my Mom did when I was in high school * embarrassing* Although it was perfectly acceptable to carry around the below frog umbrella myself during high school! I wish I could drink water but I simply don't care for it - I need some flavor in there. That's the way I'll spend my birthday too. 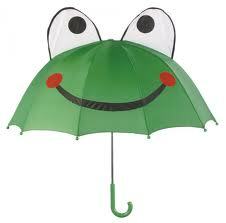 What is wrong with a frog umbrella? Nothing wrong with it really, just posted picture above so could all see it. Surprisingly my husband still dated me back then...lol. You were also the "new" girl in town.. It was something else seeing you walk down the street in your Mickey Mouse T-shirt and Blue Jean Jacket with that huge Frog umbrella. What really caught my eye was that you were not hung up on what the town thought and were comfortable being just you. I on the other hand was still deciding if I cared what they thought.. seriously a giant green frog umbrella... thankfully I took a chance and here we are 15 years later and couldn't be happier that you taught me that small lesson. I think I would also like some relaxation time! I think I'm going to add this to my birthday wish list. Started following, come by and visit, LOVE visitors. I have to admit that I might carry around that umbrella now that I am pushing 40.